Another multistate E. coli outbreak has led the Food and Drug Administration and the Centers for Disease Control and Prevention to issue a blanket warning to consumers not to eat any romaine lettuce and discard any product they may have. The food safety alert, released late yesterday afternoon, called on retail stores, restaurants and foodservice operators to not put out for sale or serve any romaine lettuce — including salads and salad mixes containing romaine — because of risk of infection with E. coli O157:H7. For consumers, the warning urges the avoidance of all types or uses of romaine lettuce, such as whole heads of romaine, hearts of romaine, and bags and boxes of precut lettuce and salad mixes that contain romaine, including baby romaine, spring mix and Caesar salad. So far, the CDC reported that 32 people in 11 states have become ill between Oct. 8 and Oct. 31. No deaths have been reported, but 13 people have been hospitalized, including one case of kidney failure. States reporting illnesses from E. coli O157:H7 infection include California, Connecticut, Illinois, Massachusetts, Maryland, Michigan, New Hampshire, New Jersey, New York, Ohio and Wisconsin. Ten of the cases are in California, and seven are in Michigan. The outbreak also appears to have hit Canada. The Public Health Agency of Canada said 18 people in Ontario and Quebec have become ill due to infection with the same DNA fingerprint of E. coli O157:H7 bacteria. According to the FDA and CDC, epidemiologic evidence from the U.S. and Canada finds that romaine lettuce is the outbreak’s likely source. The FDA said it’s conducting a trace-back investigation to determine if the romaine lettuce eaten by people who became sick was sourced from the same place. The agencies are also working with the Public Health Agency of Canada (PHAC) on the investigation. "The quick and aggressive steps we're taking today are aimed at making sure we get ahead of this emerging outbreak, to reduce risk to consumers and to help people protect themselves and their families from this foodborne illness outbreak. This is especially important ahead of the Thanksgiving holiday, when people will be sitting down for family meals. 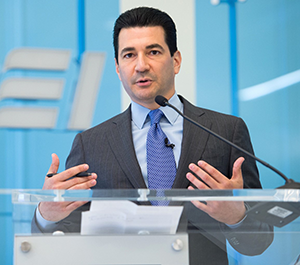 We want to get this information out to consumers early,” FDA Commissioner Scott Gottlieb (left) said in a statement. Genetic analysis indicates that sickness reported in the latest outbreak stems from the same strain of E. coli O157:H7 in an outbreak that occurred in fall of 2017, which affected consumers in both the U.S. and Canada, the FDA and CDC said. However, the agencies noted that the E. coli O157:H7 strain in the current outbreak is different than the one identified in the large outbreak this past spring, which was linked to romaine lettuce from the Yuma growing region. The spring 2018 E. coli O157:H7 outbreak linked to romaine lettuce, declared over in late June, infected 210 people in 36 states, with 96 being hospitalized and 27 developing kidney failure. Five deaths were reported. CDC lab testing identified the E. coli O157:H7 strain in canal water samples taken from the Yuma growing region. The FDA is continuing to investigate the outbreak to find out more about how the E. coli bacteria could have entered the water and how the water could have contaminated romaine lettuce. In the fall 2017 outbreak, which began last November and ended this past January, 25 people in 15 states were sickened, resulting in nine hospitalizations (including two with kidney failure) and one death. The illnesses were linked to a Shiga toxin-producing E. coli O157:H7 (STEC O157:H7) from contaminated leafy greens, possibly romaine lettuce, though the investigation wasn’t able to identify a specific type of leafy greens as the source. Several provinces in Canada also were affected by the outbreak, and while PHAC linked the infections to contaminated romaine lettuce, it wasn’t able to identify the product source. “This isn't the first romaine outbreak we have seen in the recent past, and we will continue to take steps to identify the root causes of these events and take action to prevent future outbreaks,” Gottlieb added. “We're committed to working with our partners to implement additional safety practices so that we'll be better-positioned to prevent outbreaks like this from occurring. In the meantime, we'll continue to take action around this outbreak to help protect American consumers from eating potentially contaminated romaine lettuce as our current investigation unfolds." Earlier this month, Gottlieb announced that the FDA has been working closely with the leafy greens industry and state and federal partners to find out more about the causes of such contaminations and institute safety practices to lower the risk of outbreaks. Besides stressing the need for full implementation of the Food Safety Modernization Act (FSMA), he noted that traceability is critical to removing the product from commerce as quickly as possible to mitigate consumer exposures and focus potential recall actions. In late September, Walmart unveiled a new food safety program that will require suppliers of fresh leafy greens to use a blockchain-based solution the company piloted with IBM. Called the Walmart Food Traceability Initiative, the effort aims to give suppliers the ability to trace fresh, leafy produce from farm to table in real time using the IBM Food Trust Network. Suppliers will be required to capture digital traceability event information using the IBM system and be up and running on the network in about a year. More retailers have since joined the IBM Food Trust Network, including Carrefour, ShopRite parent Wakefern Food Corp. and grocery group purchasing organization Topco Associates. IBM said in earl October that the network is now generally available after 18 months of testing. The pilot phase involved millions of food products tracked by retailers and suppliers, including Walmart, The Kroger Co., Driscoll’s, Dole, Golden State Foods, McCormick and Co., McLane Co., Nestlé, Tyson Foods and Unilever. Going forward, the FDA also plans a new program to sample and test romaine lettuce across the marketplace for potential contamination.